Here it is. Your relaxation destination. 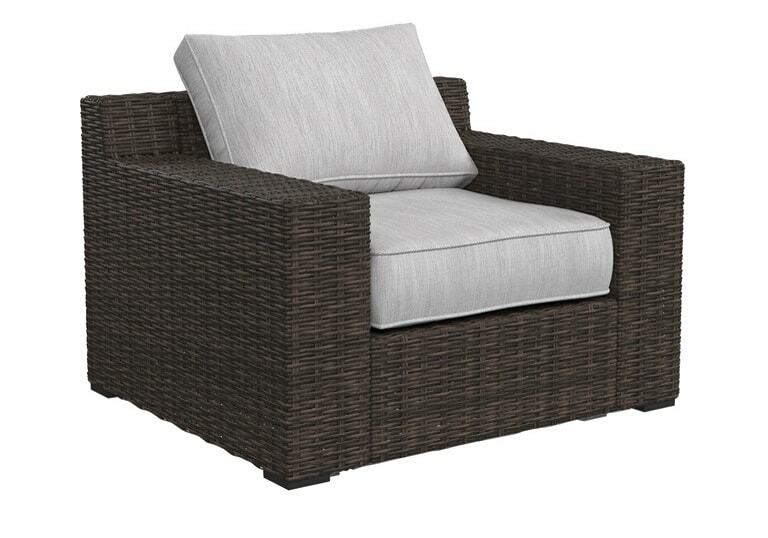 The Alta Grande outdoor lounge chair is perfectly positioned for ultimate comfort. All-weather resin wicker lends an elegant air, while the rust-proof aluminum frame ensures durability. Cushions are covered in fade-resistant Nuvella™ fabric for years of worry-free outdoor living. For indoor or outdoor use (excluding fire pit). Cushioned resin wicker seating, modular seating and fire pit chat set. 2 throw pillows included with loveseat and sofa. 6 throw pillows included with LAF/RAF loveseat set. 2 throw pillows included with corner chair. Corner end table has a tempered glass top. Rust free aluminum frames. Some assembly required. High performance Nuvella fabric. Collection includes a variety of modular seating options. Choose from cushioned corner chair or corner with glass top shelf. Fiberglass-resin top fire pit: 35”W x 35”D x 25”H. Fire pit includes: CSA approved 40,000 BTU stainless steel burner, glass beads, burner cover and weather cover. Battery powered ignition (battery included). Can be converted for natural gas use.